To begin with, a heartfelt "thank you" to pixy for being so kind about reactivating this little bit of digital real estate. It lay about empty for so long, it will take weeks to get the weeds pulled, the shrubs trimmed, and the rodents routed. And the size of those rodents! Not to mention the sheer numbers of them. Sadly, they have gotten so bad that I have been forced to turn of comments for the time being. Not that any of you will find yourselves compelled to comment, but it would have been nice to have left them available and unmolested. Damned ratus spammicus. 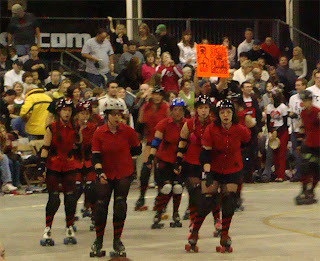 Well, if they refuse to cease and desist, I may be forced to send a few roller babes after them. The visual of tough, fish-net wearing, wheeled warriors scattering the vermin hordes is so very satisfying on levels most can barely comprehend. If it works for you like it works for me, you may want to find some time in your busy schedule to indulge in such Female-Dominant Mayhem by taking in a bout with the Naptown Rollers here in Indianapolis. Where else can you enjoy hot, sweaty, voluptuous and violent vixens in scanty clothes and wheeled leather boots whipping asses, taking names and leaving long lasting marks, all in a fun-filled family event? Most places require valid photo ID, a two drink minimum, a wad of singles for tipping and a steep cover charge for this much fun. I think it's time for an outing. Pack up all of Lillith-Indy and go see a game as part of the munch. Get everyone all worked-up. Make a party out of it. Lillith? You ask "Who is Lillith" and want to know what a munch is? Ah, that is for another time, little one.